On my journey toward a simpler, more deliberate way of life, some decisions have been more meaningful than others. My decision to stop using my ailing dishwasher and deal with the dishes by hand was one of those very important decision for me. In this third part of my 10-part series on the best decisions I’ve made so far along the path toward the simple life, let’s talk about dishwashers — and how eliminating yours can have meaning beyond the obvious. In my March 8, 2011 post called Does A Dishwasher Fit Into A Simple, Minimalist Life?, I wrote briefly about the reasons why a dishwasher isn’t really a very good idea. These include the costs of the machine, the time involved in loading and unloading it, the energy required to power it, the caustic and expensive chemicals to make it work and the irresponsible behavior that not having to worry how many dishes you dirty encourages. And since my dishwasher had seen better days anyway, I found that my dishes were much cleaner if I did them by hand. The post was brief, but the discussion it generated was lively and lengthy. The post even inspired Jenny from ExConsumer to try managing without her dishwasher. In Jenny’s Take On Ditching The Dishwasher, she writes about her experience. It’s been a year now, and we’re still washing our dishes by hand. The old dishwasher has been serving as a drying rack, but we’ve started to notice a bit of mildew in it. Soon, it will be time to eliminate from our house this machine that we’ve already eliminated from our lives. Do you have any ideas on how to fill in the hole it will leave? As you can guess, I don’t want any more cabinet space. We still have too much junk as it is, and the last thing we need is more storage space to encourage more storage. We’ve made a few lifestyle changes to make dealing with dishes easier. In addition to making sure I always have a good dish pan and a type of scrubber I like, we have also eliminated some of our plates and utensils. We can’t dirty something we don’t have. We rinse or wipe off dishes that have only been used for a cookie or roll and use them again before washing too. Since there are only two people in my household, having more than four plates out for use is silly. If we should ever have more than one or two guests, we can dig a few spare dishes out from under the kitchen counter. Eventually, we’ll donate all but a few of the extra plates and silverware. Toward the beginning of my decluttering journey, I wrote about Eliminating Housewares. Since that post on April 21, 2010, we haven’t bought any new kitchenware, and we’ve eliminated a lot more. Have you reduced your kitchenware since starting on the path toward a simpler life? Having less kitchenware to keep clean is one of the keys to making life without a dishwasher better than life with one. And what about a dishwasher? Do you have one? Do you choose not to use it? For me, the decision to ditch the dishwasher was about more than just eliminating a machine that seems more useful than it really it. It was an important step toward organizing my life on my own terms. It was a decision I made that symbolizes my commitment to living my life how I want to live it, not according to societal norms. People fortunate enough to have dishwashers use them, don’t they? Nope, as it turns out, I don’t. Flipping off the dishwasher’s breaker can be an important step in showing yourself and anyone else who’s watching that you choose to live a better, simpler life — a life on your own terms. Gip…good for you. I gave up on dishwashers a long time ago. In the couple houses that had them we used it for a drying rack (and to store clean dishes). The savings and habit of doing dishes as you get them will pay off in your quest for a minimal life. I even stopped using detergent and hot water (just a bit of vinegar). If you want to use the space, consider making an indoor vermi-composting center. You can get rid of all sorts of rubbish and create great soil. The worms are very efficient and don’t smell. It saves valuable time in your minimal life by getting rid of almost everything organic, paper & cardboard included! I’ve tried composting before but never committed to it. I wonder what our cats would think of a tub of worms in the house? I’m also a fan of vinegar as a cleaner. I use dish detergent, but I also use vinegar for glass items that won’t come clean any other way. I also use vinegar in the washing machine, to get hard-water stains from the tiolet and for lots of other things. Thanks for commenting, Stephen. Always good to have you here. The cats probably won’t care about the worms (in fact they probably won’t even see them). They might be fascinated with the new space, however! Vinegar is great. I too, use it for all my cleaning and clothing needs. If you use a containter inside the sink when washing, like the europeans, you can take the leftover vinegar/water and pour it in the toilet to disinfect. There is also a potential to get rid of pests, weeds, viruses, fungi and other issues in your garden. This thread is interesting. It seems to have a theme of resistance. The items that people perceive to make life easier do not actually make it so. Minimalism and simplicity is the point here. I went through many of the same arguments and until I actually implemented them, didn’t truly understand how changing your mind to accept the ideas was half the battle (the harder part). 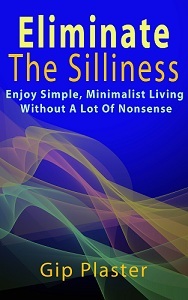 Like Joseph points out the more minimal, the more simple and enjoyable life becomes. The point of embracing the lifestyle is to enjoy the purpose and meaning. It’s to appreciate what we have. It’s to reduce our daily impact on not just the world but our levels of stress. BTW…like the dishwasher and other items you have reduced, when you get rid of the dryer you will thank yourself. Your clothes will last longer, they will feel more fresh, your utility bills will be reduced and you will not lose any time hanging them up and folding them. You may even get clothes that are more breathable and quick drying. All in all a decision you will never regret. We could write a book about vinegar — except that several people already have. I’ve noticed the resistance too — along with others who say they’ve been living without certain machines for years. A reluctance to try a better way is what keeps so many people from understanding how it can benefit them. I also appreciate the responsibility that doing things by hand creates. I admit to reluctance about getting rid of the washer and dryer, but I think circumstances will force the issue soon. I wear jeans all the time though — and I’m over 6 feet tall — so that’s a lot of fabric to wash by hand and hang to dry. Still, everything I have is worn out, so I could use a new wardrobe. There’s another solution to the laundry issue, Gip: figure out how to do less laundry less frequently. I only do laundry a few times a year, because I only wear clothing when the weather necessitates it or I’m going to be out in public, where laws and societal norms dictate it. I’m working on a post that’ll eventually show up on my site about how naturism is a perfect fit with minimalism. I sort of expected you to say something like that. Yes, that’s a good idea, but I spend a lot of time out in public. Still, it really is a good idea! We do have a dishwasher, and it actually saves a lot of water over washing all of our dishes by hand. Unless we absolutely had to, I can not envision getting rid of our dishwasher any time soon! As for your space, could you put your garbage/recycling bins there? I like the idea of the vermicomposter too! I’ve heard the argument that dishwashers save water, but I’ve also heard that it isn’t true. If you open door during a cycle and look at how much water is in there, you might be surprised. Also, they use power. Ditching the dishwasher will change your life. I promise. You have decide to use fewer dishes first though. Oh, it also has the BEST feature: sanitize….worth it when you have two germy little boys! When I used to live in houses and apartments, sometimes I had a dishwasher, sometimes not. Since I also had room in my cupboards for a service for eight, and lived alone, I could go all week between dishwashings. I suppose it was a timesaver for me to just throw the dirties in the dishwasher each day, then empty it once a week, but I haven’t the room now and don’t miss it. As for what to do with the space, I like the idea of trash/recycling/composting space. Another thing you could do is leave it empty, providing leg room so that you could sit at the counter with a stool or something, either for eating or food prep work. Or even a desk, depending where the dishwasher is relative to the rest of the kitchen layout. The diswasher is right next to the sink, so a desk isn’t a good idea. As much as my back was hurting in the kitchen earlier, a stool sounds like an excellent idea! I’m leaning toward putting a board over the hole and forgetting about it. Of course, I haven’t moved the dishwasher out yet. My home is the first place I’ve ever lived in that has a dishwasher and the novelty has still not worn off. Heck yes I use that baby, but only with full loads, the shortest cycle and homemade dishwasher powder (1/2 washing soda, 1/2 borax with vinegar as a rinse aid). We dirty a lot of dishes with packing our lunches and eating at home and I have no desire to go back to handwashing. Candi @ min hus recently posted YMOYL Online Book Club: Who’s In? Some people love their machines. I’ve always had a dishwasher, so I was surprised to learn how much simpler life is without one. My parents had one, our apartments had one… so it was always there. I tried a variety of detergents in my dishwasher, including homemade. That’s certainly the best way to go, but it didn’t work with my machine. The real stuff didn’t work very well actually… Vinegar does work just as well as a rinse aid as the stuff they sell though. I’ve lived with ’em and without ’em but it would take A LOT to get rid of mine. I live alone so i only wash once or twice a week and only a full load. I wish I were the type of person who would wash dishes as I used them but I know myself too well. I wish i would do a lot of things i know i will not do. i am in a state of depression most of the time. I would love to be a neat and tidy person that i dream about but at my age i’ve stopped making myself feel bad about it…LOL But I love hearing from ya’ll about how you are making progress in your life. It’s good to know some can do it. You can do it too, although ditching the dishwasher may or may not be part of the simple life for you. The good news is that you can do one thing right now to make your life better — like cleaning out a closet, throwing out your excess kitchen utensils or cancelling your cable TV, for example. You can make your life better immediately and forever. I’m not at the ditching stage yet (and I live in an apartment where it’s not my own property anyway), but I do use my dishwasher primarily as a drying rack. I find that actual drying racks take up valuable counter space and never hold very much. I like the idea of one person washing and another drying to eliminate having to have a drying rack. I’m not sure what your refrigerator situation is, but a lot of simple-living folks are trying to get rid of theirs or downsize to reduce energy consumption. The dishwasher space would be good for a small fridge, but of course that would leave a space where the larger fridge was. But it’s something to think about. Domestic Kate recently posted Finally a finished object for February! I’ve often thought about downsizing the refrigerator, but mine works perfectly. It’s over 10 years old, however, so it can’t last forever. I could certainly manage with a much smaller one. My clothes dryer will probably be the next appliance to fail, and I’m not looking forward to doing without it. We have done away with dishwashers for quite a few years. Me and my wife realized that by living minimally, we also had more time for our family; on the contrary, when we related most tasks to gadgets, we seem to have more things to do. That’s exactly my point, Joseph. Thanks for stating it so well. Gadgets and appliances generally take away from our lives, not add to it. I applaud your decision. I decided a few years ago to stop using the dishwasher in order to save money. I also realized that when I used the dishwasher, I would often just let the clean dishes sit in it for a few days because I didn’t want to clean it out! So now for each meal, I use my few dishes, pans, glasses and then immediately wash them in the sink and let them dry in the drainer. As a result, I have fewer dishes to put up and I know I’m saving money on electricity and water. You’re absolutely right, Carol. Thanks for commenting. Technology often complicates what could be a simple, deliberate, wonderful life. I haven’t quite gotten in the habit of washing everything immediately, but things are getting dealt with quicker than when we used the dishwasher. We have a virtually brand new unused dishwasher, it was bought for us some time after our previous dishwasher had given up on life. During the period between the old washer expiring and the new one being installed we found that we could very easily live without one. Concerns about the effect on the environment were worrying us before the original one packed up, but it was easy to put the dishes into it and as there was only two of us, most of the time, it was used half full. Using a dishwasher half empty is a serious waste of power, plus you have the added contanimation with the cleaning products used. The new machine is now a few years old, but looks as good as the day it was installed, in those years it has been used a handful of times when it has been convenient to fill up. Dumping the dishwasher not only unclutters your life, but it helps the environment. I completely agree, Keith. It’s nice to have to here, by the way. Although it’s possible that a full dishwasher could use less water than washing the same number of dishes by hand, dishwasher detergent is caustic and just plain nasty. I never liked the idea of it being on my dishes anyway. When we get our old dishwasher removed, I think a nice piece of wood to cover the hole is all we’ll need.